On the heels of his five-book fantasy series, The Chronicles of Dorro, author Pete Prown brings us a new tale that returns readers to the magical world of Thimble Down—but with a twist! In Master Blacke, we journey to the other side of the Great Wood and meet exciting new characters from the village of Wattle’s Way. Among the players in this saga are Rue and Doily, as well as a strange and deadly kestrel named Jesper Stormcloud, who becomes their friend. There’s also the wise schoolmaster, Master Blacke, and the wicked, but beautiful Minerva Silvercoat and her equally blackhearted accomplice, Mr. Slinks. The story unfolds with the arrival of Rue, a shy girl lost in the Great Wood. Master Blacke settles Rue into the home of Mrs. Locke, a cold shopkeeper, and her mean-spirited daughter, Meera. There’s something else, too—Doily overhears villagers talking about The Vine, something which will change the way the village is run and who’s in charge. The mystery deepens as townsfolk begin to disappear one by one. Even Master Blacke is baffled by these dark, ominous events. There’s danger in the heart of the Great Wood. After centuries of peace and tranquility, there’s a plot by the bigger creatures — who call themselves The Vine — to seize power and take control of the meek. Soon, the fast-paced saga begins, as Rue, Doily, and Jesper find themselves battling for their very lives and fighting back with the help of their tutor, Master Blacke. But will it be enough to defeat The Vine and its forces of evil? Welcome to the Great Wood, friends …. 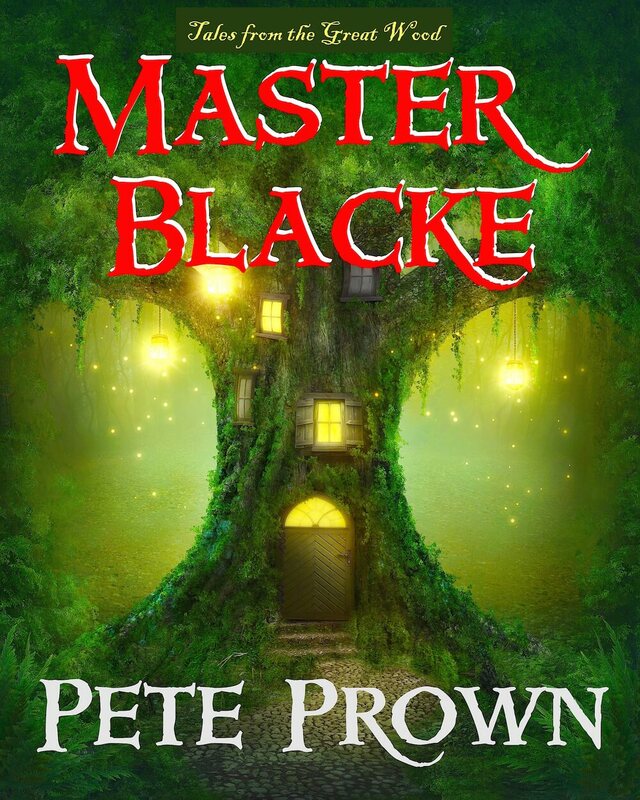 Master Blacke: Tales of the Great Wood takes readers on an epic fantasy adventure. Young readers, aged 9 to 13 – as well as not-so young ones—will have trouble putting it down. It is available for sale on Amazon, iTunes, Barnes & Noble, and Kobo. Rue stubbed her toed and screeched in pain—she was lost and knew it. The small, brownish pocket-mouse hadn’t seen her parents for weeks, and left their comfy mouse-hole in the Great Wood to search for them, even though her mother said her shouldn’t ever do so. They’d never been gone this long before. Young and naïve might Rue be, but not entirely foolish. As the afternoon grew long and began throwing shadows, she flitted from leaf cover to tussock, remaining exposed in the open as little as possible. She dug up a few mouthfuls of nuts, roots, and berries as she explored—Rue had never been alone in the forest before, but on the whole, rather enjoyed it. She laughed out loud, but tripped over something hard while crossing a mossy pad. Rue was perturbed and didn’t mind who knew it. Then she sneezed. And she sneezed again. Ach-choo! Curiously, she became aware of something moving in the periphery and all her hairs stood on end. It didn’t feel right. “Who are you? I can’t see you,” snipped Rue, transfixed by the deep, mellifluous voice. She heard something sniffing over yonder, under the fronds of an ostrich fern swaying gently in the breeze. Rue sneezed and became wary again. Something in her veins and blood told her Beware!, but she couldn’t put a finger on it. She’d never really been afraid before, as her parents were always nearby and calmed her when a thunderstorm struck and the rain pelted about the door to their mouse-house. What is that strange tingling in my paws and legs? thought the mouse girl. My senses are trying to warn me of something, but I don’t what it is. Suddenly, Rue knew exactly what the tingling was, just as the ferns began to shiver and move. Something was moving in those fronds, inching closer by the second, and it meant her harm. Then Rue saw it—a black snout pushing through a few fronds. The snout grew longer and impossibly longer, until a face peered out. A sharp face with reddish fur, two pointy ears, and a pair of glowing orange eyes. And its mouth was smiling, but not a friendly smile. It was more of a leer, displaying quite a rack of dazzling teeth. The pocket-mouse knew she was in trouble, as this was surely a red fox seeking its supper. “You are an astute young lady—quite intelligent! My name is Mr. Slinks, though I’m not such a bad fellow,” said the red fox with his usual grace and savoir-faire. He kept talking. “My job in this part of the Great Wood is to bring balance and order. When something is out of place, I fix it. If Genevieve Possum has too many babes one spring, I help her return her litter to a reasonable number. And should the robin or wren population explode for unknown reasons, just call on Mr. Slinks to scale a nice low tree, find the nest, and bring the number back to earth —quite literally! Logically then, should a tasty mouse get lost and wander into my dell, as a concerned citizen I feel I should do my part to rectify the issue—quickly and with the utmost skill. At that, Rue shot from her moss pad like a rocket, so fast that even a deadly predator like Mr. Slinks was taken aback. He figured the lass would make a fine nuncheon and be perfectly civilized about it. Perhaps even lie down and expose her neck in a cordial way, in order to make the fox’s job easier. But no, this brat wanted to put Slinks to the test. Catch me if you can, Big Nose!” laughed the girl as she shot under a thicket of rambling roses and in and out tufts of grass. It would have been a wonderful game if the mouse didn’t hear a Snap! and feel the wind-gust as a pair of jaws narrowly missed her tail. This spurred Rue on faster, but she knew she couldn’t run forever and that about twenty of her steps equaled only two of Mr. Slinks’. Mathematically, the fox would catch up to her in about five seconds. Fortunately for Rue, fate was on her side, as a new commotion exploded to her left. For a second, Rue couldn’t make out what was happening, but then saw flashes of white and black just off the way. She also knew it wasn’t good news for her rival, as Slinks shouted out a most unfortunate expletive—one we shan’t repeat here in the name of proper decency—and followed it up with various snarls, grunts, and barks. The race bounded down a sharp slope, with Rue in the lead, Mr. Slinks in hot pursuit, and an unknown personage running interference. The pocket-mouse reached the bottom of the dell and found a rapidly running creek in her way. She leapt onto a flat rock in the water, and then another and another, her toes getting quite wet in the process. It was at this precise moment that Rue made a grand leap for the far bank, but slipped and missed her mark by a foot. Instead, she landed in a bit of muddy muck and lay immobile on the creek’s bank. She rolled over and, just Mr. Slinks had hoped, exposed her soft belly and throat dangerously. “A-ha! The day is mine,” gloated Slinks as he bounded across the creek for the final kill. But t’was not to be. For as our friend Rue lay prostrate in the mud, a shadow crept over her, blotting out the light and burying her in dark fur. Mrs. Posey growled in return and extended her claws. “If you consider high-mountain wolverines to be little bunnies, then yes!” cackled the skunkess in return. “Curse you, Posey! Always ruining my sport. I just wanted to have a bit of a go at the tender thing,” sneered Slinks. Mrs. Posey relaxed her posture over Rue and let a little light and air penetrate. As she moved off, the mouse-ling saw a beautiful black-and-white skunk taking shape, while Mr. Slinks glowered at them both from a rock in the middle of the creek. She took a few steps away from Rue as matters calmed, but was distracted by the Caw! of a fish-crow in a nearby sourwood tree. That’s all it took for Mr. Slinks to make his move. Bounding the final steps between himself and young Rue in half a heartbeat, the red fox suddenly had the young pocket-mouse cradled in his jaws, even before Mrs. Posey had a chance to turn around. “How dare you, Slinks! I thought you were going to be a good boy today,” snarled the angry skunk, once again dropping to combat posture. At that, Mrs. P. spun on a tuppence and, from a gland within her hind quarters, hit Mr. Slinks with a massive blast of skunk stink. With skunk juice stinging his eyes and fouling his nose and mouth, Mr. Slinks had no choice but to drop the equally befouled Rue in the creek and run screaming into the woods. And it was true, Mrs. Posey had doused the fox so completely that he wasn’t able to find any tasty prey beyond beetles and worms for the next few weeks and, along the way, lost a full three pounds. With that, the black-hearted fox disappeared into the forest. Poor Rue, meanwhile, was not only drenched in skunk stink, but was also being borne down the creek with great force. Neither could she swim, thus was gasping for air in between desperate strokes in the bubbling, frothy water. Fortunately, Mrs. P. was on the scene in a flash and, before she knew it, Rue was gently hoisted into the air within the front teeth of her new protector and carried back to the very soft, spongy moss pad from whence her very troubles had begun. Exhausted, wet, confused and thoroughly skunked from head to toe, Rue began to cry, yet soon drifted off to the lands of sleep and quiet. Over her, Mrs. Posey stood guard, humming a tune to herself. In that time, she knit her a blanket of sweet-smelling lavender and clover petals, which drew out the stench and coaxed sweet dreams within the girl’s heart. As the hours passed, the forest calmed more and more until this recent episode was all but a distant memory. From somewhere above them in the Great Wood, a grey thrush hooted the “all clear” signal and life resumed as usual. Pete Prown is a noted American writer of Young Adult fantasy books. His debut fantasy series The Chronicles of Dorro (Thimble Down, Devils & Demons, The Lost Ones, Death of a Dwarf, and Goblin War) has received rave reviews. THIMBLE DOWN, the first book in the “Chronicles of Dorro” series, tells the tale of a Halfling bookmaster named Mr. Dorro and the dark mysteries he becomes entangled with, along with young companions Wyll Underfoot and Cheeryup Tunbridge. Fans of the Dorro series can’t get enough of the classic-fantasy action and adventure, as they explore the magical world of Thimble Down and its surroundings.